Danthonia spicata plant. By Glen Mittelhauser. Copyright © 2018 Glen Mittelhauser. New England Wild Flower Society. gobotany.newenglandwild.org (Accessed 2/2018). Danthonia spicata, stem, ligule and sheath. By Marilee Lovit. Copyright © 2018 Marilee Lovit. New England Wild Flower Society. gobotany.newenglandwild.org (Accessed 2/2018). 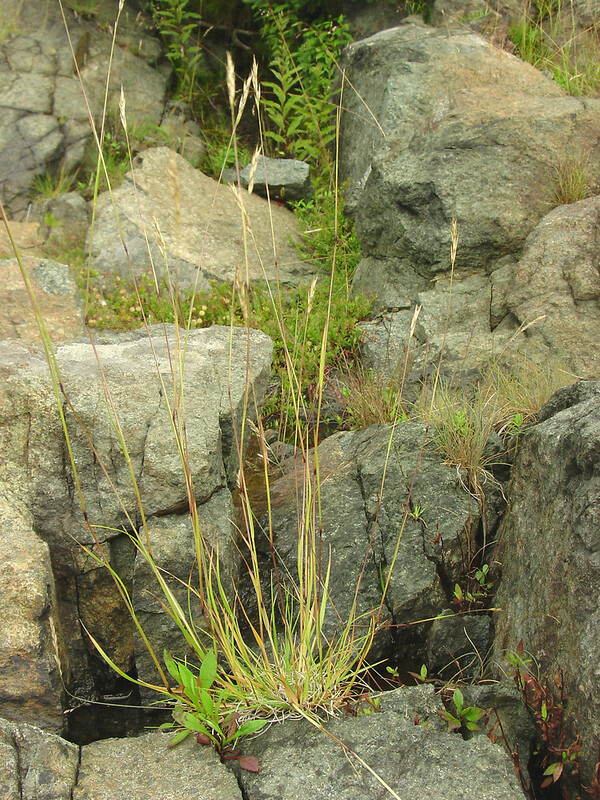 Danthonia spicata is a perennial grass with C3 metabolism (Basinger 2002), tufted, from fibrous roots often found to be associated with arbuscular mycorrhizal fungi including: Glomus aggregatum, G. constrictum, G. fasciculatum, G. geosporum, G. microaggregatum and G. mossae (Zygomycetes) (collections in Canada) (Darbyshire and Cayouette 1989); stems slender, 20 cm to 1 m; top of sheath usually with dense tuft white hairs, ligules a fringe of white hairs to 0.1 cm long. Leaves mostly basal (much less than half the length of the flowering stem), senescent leaves curly, stem leaves to 3-18 cm long, 0.1-0.2 cm wide, sometimes hairy below. 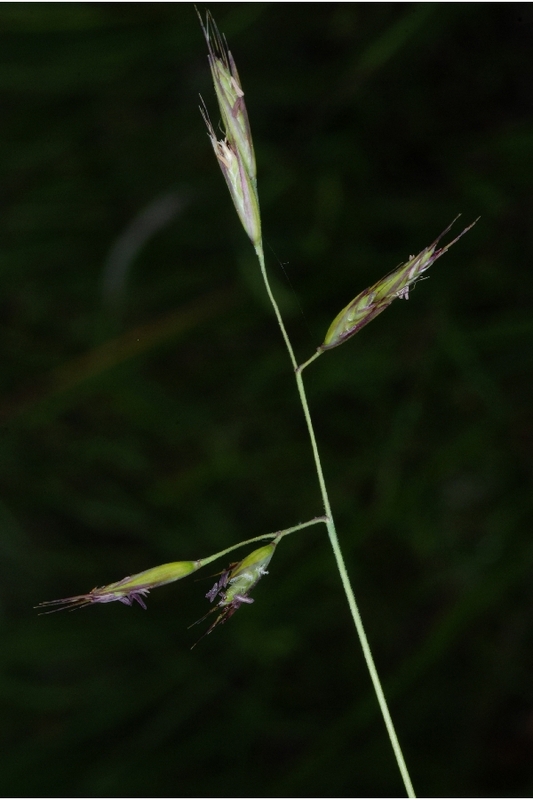 Flower spikelets slender, with 3-10 florets, to 1.8 cm long, lower branches shorter to slightly longer than spikelet; glumes about equal, 0.9-1.3 cm , lemma finely hairy, awned at tip, to 0.9 cm long, often curling, arising from between 2 teeth 0.1 cm long at tip of lemma; early inflorescence terminal, wind pollinated (Clay 1984), contracted, often spike-like before and after blooming, sometimes open when blooming, sparse, 2-5 cm long, short branches mostly with one spikelet, later inflorescences mostly with 1 minute floret, enclosed in leaf sheaths throughout development (cleistogamous); self-fertile; blooms May-June. Fruit: seed matures June-July. 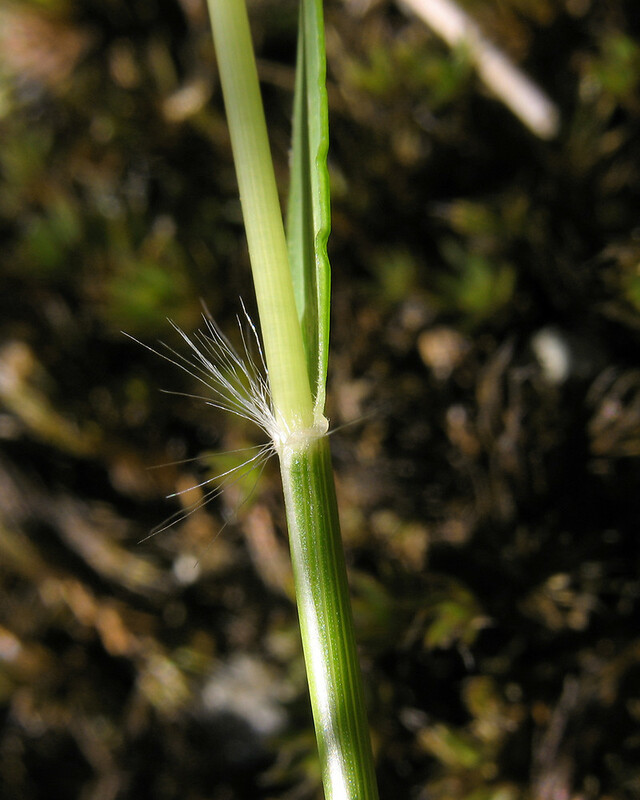 Seeds of terminal, exert, inflorescence, dispersed close to parent plant, seeds of enclosed dispersed as the old stem disintegrates, some lower seeds develop just below soil surface and germinate in situ. Seeds can remain dormant in soil for a number of decades (Darbyshire and Cayouette 1989). Habitat: Dry, sterile soil of open woods and edges. Tolerant of a wide range of habitats, open areas to forest light gaps (Scheiner and Teeri 1986), also found in bright understory. Photosynthetic light saturation occurs at about 40% of full sun, growth is restricted at 20% full sunlight. Tolerant of a wide range of soils from acid sand to limestone barrens. Notes: Attacked by the leafhopper, Latalus personatus, larvae of the butterfly Oeneis chryxus (Ontario Can. ), a chalcid wasp, Harmolita danthoniae, and the grass aphids, Geoica squamosa and Prociphilus erigeronensis (Darbyshire and Cayouette 1989). Also fed upon by Hesperia leonardus (Leonard’s Skipper), Hesperia sassacus (Indian Skipper), Chortophaga viridifasciata (Green-Striped Grasshopper), Orphulella speciosa (Slant-faced Pasture Grasshopper), and the leafhopper Laevicephalus melsheimerii .at least in Illinois (Hilty 2006). Often infected with an endophytic fungus, Atkinsonella hypoxylon (Clavicipitaceae, Ascomycetes), that causes the disease “choke” or “black stripe”. This fungus has been shown to increase survival and growth but decreases reproduction. Fungal endophytes grow in the above ground parts of many graminoids and often cause sterility by infecting flowering parts. They are reported to produce toxins that deter herbivores (Clay 1984). This infection may causes loss of the florets of the terminal inflorescence. However, other studies show a more mutualistic relationship in which fungal toxins inhibit attacks by herbivores. Other fungal infections are caused by Ustilago residua, Puccinia graminis (Basidiomycotina), Rhynchosporium secalis (a sooty mold, Ascomycotina) Epichloe typhina and others. At least two hemiparasitic herbs in the family Scrophulariaceae also use Danthonia spicata as a host; wood betony (Pedicularis canadensis) and cowwheat (Melampyrum lineare) (Darbyshire and Cayouette 1989).